Apply to audio and speaker cables, used to transfer low frequency, audio signal or sound engineering conference room and home theater. Speaker cable, referred to as an audio cable, is used to transmit electrical acoustic signals or data. Broadly speaking, there are two major categories of electrical signals and optical signals. The line that the audio cable uses to spread the sound. It consists of two parts: the audio cable and the connector. The audio cable is usually a two-core shielded cable. The common connectors are RCA (commonly known as lotus head), XLR (commonly known as card head), and TRS JACKS (commonly known as plug head). 3 Core Cable refers to materials used in power, communications, and related transmission applications. There are no strict boundaries between "wires" and "cables." Generally, a product with a small number of cores, a small product diameter, and a simple structure is called a wire, a non-insulated wire is called a bare wire, and the other is called a cable; a conductor having a large cross-sectional area (greater than 6 square millimeters) is called a large wire. 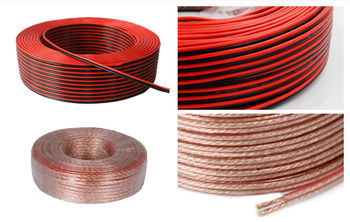 Small (less than or equal to 6 square millimeters) is called a small wire, and insulated wire is also called a wire.